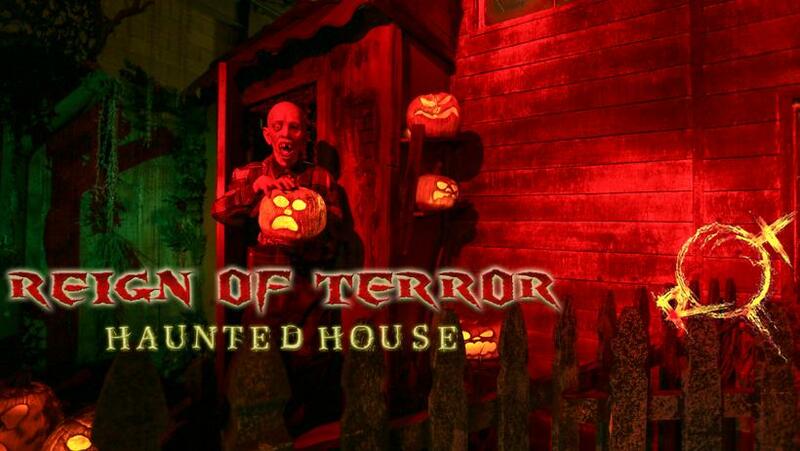 SEPTEMBER 13, 2018 — THOUSAND OAKS, CA — Janss Marketplace announces the 2018 dates for the 15-night Reign of Terror Haunted House, one of the top ranked immersive haunt attractions in the U.S. Now entering its 19th-annual season, Reign of Terror, will be open to the public on September 29, October 5, 6, 12, 13, 14, 19, 20, 21, 26, 27, 28, 30, 31 and November 3 at Janss Marketplace, located off the 101 Freeway, at the intersection of Hillcrest Drive and Moorpark Road in Thousand Oaks. Reign of Terror hours are 7 – 10 p.m. weekdays and 7 – 11 p.m. on Saturdays. Each year, the annual haunted house at Janss Marketplace adds new exciting features. For the 2018 season, each of Reign of Terror’s 8 separate attractions has been expanded or updated with new special effects, new scenes and new fear inducing characters. In all, the haunted house contains 105 separate rooms. Reign of Terror’s 2018 edition marks the largest production with the most rooms inReign of Terror’s 19-year history. Included in the updates for 2018 is an entirely new attraction, called “Inbred”, which features a group of strange and creepy family members living in a ramshackle shack in a forgotten corner of the countryside. Also new for 2018 is “The White-Out Experience”, located inside Reign of Terror’s Fun House attraction. The “White-Out Experience” gives visitors a uniquely unsettling sense of time and place. In addition, on November 3, Reign of Terror will host its first-ever “Lights OUT” event. Visitors to “Lights OUT” will walk through all 105 rooms in total darkness, lit only by one small glow stick per person. This will allow guests to experience Reign of Terror like never before. Reign of Terror is an intense experience geared for horror and thrill-seeking fans, but it can still be enjoyed by all ages. For families with younger children, Reign of Terror Lights On tours are offered two Saturday afternoons, October 20 and October 27 from 1 – 4 p.m. Lights On tours have no special effects, no darkness or scares in operation, but all regular lighting is on. Admission for the Lights On tour is $5 for children and adults, payable at the Box Office. Additional information is available on our website: https://rothauntedhouse.com/. Each year, Janss Marketplace’s annual donation benefits the District’s Thousand Oaks Teen Center, Young Artists Ensemble programs and the Conejo Theatre for Everyone, which gives special needs youth the opportunity to perform. Over the past nine years Reign of Terror at Janss Marketplace has generated over $200,000 in donations. Open 15 nights. Our biggest season ever. Over 105 separate, custom designed rooms. 8 separate, interconnected attractions target a different type of fear. Covers 23,000 sq feet of indoor floor space, making it the single largest indoor haunted house in all of Southern California. New Attraction: “Inbred” – Visit this creepy family who live OFF the grid, but unnaturally. New Experience: “The White-Out Experience”- You won’t believe your eyes. New Adventure: “Lights OUT” – After you see Reign of Terror once, come back again on November 3 to be terrified all over again, this time in TOTAL darkness. New Features, New Effects and a Horde of New Characters added throughout the entire Haunt.